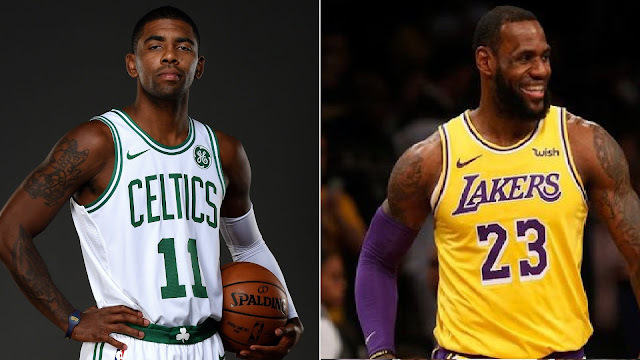 Will Kyrie Irving reunites with LeBron James in Lakers uniform? NBA – Rumors are spreading around the National Basketball Association (NBA) involving a possible team up of Los Angeles Lakers superstar LeBron James and his former Cleveland Cavaliers teammate and now Boston Celtics franchise player Kyrie Irving. Rumors spread when Kyrie Irving called LeBron James and then apologize for his mistake for being naïve during their stay in Cleveland which he later admitted in public. This coming summer, Kyrie Irving will become a free agent where he could possibly sign a maximum contract for any team. This could be the best chance that he could reunite with James for another possible run in the NBA Finals or stay in Boston to prove that he is the man and own his own team. As we remember during the 2017 summer, Kyrie Irving demanded a trade from Cleveland after knowing that the Cavs ownership and management doesn’t want him to stay? Meanwhile, LeBron James was suddenly becomes the scapegoat of Irving’s demand trade where all the blame was thrown at him for not stopping Irving from leaving Cleveland or was even reported that Irving doesn’t want to team up with James anymore? But all of that rumors are finally ended when Kyrie Irving break his silence and admitted that it was him who become naïve not realizing that days what James is doing for the team to become successful. Kyrie and LeBron together with Kevin Love formed a Big Three in Cleveland, where they reach 3 straight NBA Finals together and becomes an NBA Champion in 2016 where they ended a 52 year drought in Cleveland, when Kyrie left, James and Love reach another NBA Finals appearance but swept by the mighty Golden State Warriors in the 2018 NBA Finals which they badly missed the services of Irving. Though all of this is all for the past and this is now the present will the two superstars reunites again in LA? Let see and wait this summer? No Comment to " Will Kyrie Irving reunites with LeBron James in Lakers uniform? "